Thanks to my Instant Pot, these ribs came out perfectly tender with very little effort and time on my part. I prepared the recipe with a few substitutions and measurement adjustments to suit my tastes but overall this comes together very quickly. Don't let the list of ingredients fool you! 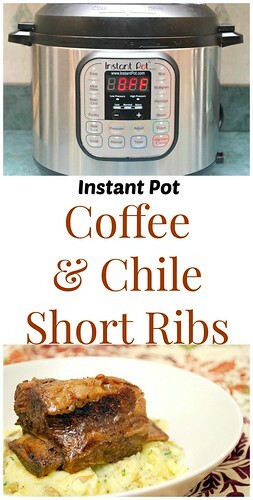 Half of the ingredients are whizzed in a blender to create a chile sauce while the ribs are browned before placing in the Instant Pot. The chile sauce and brewed coffee are poured over the ribs and then you walk away. Before you know it, dinner is on the table and a delicious one at that! I served this over garlic mashed Yukon potatoes, and roasted carrots and asparagus.If you don't have an Instant Pot, you can get the slow cooker/crockpot recipe version here! Soak ancho chiles in a bowl with boiling-hot water until softened, about 20 minutes, then drain in a colander set over a bowl. Transfer ancho chiles to a blender and purée with onion, garlic, chipotles with sauce, maple syrup, lime juice, and 1 teaspoon salt; set aside. Pat ribs dry and sprinkle with pepper, garlic powder and remaining 2 teaspoons salt. Press SAUTE on IP; add oil into IP and when hot, add seasoned ribs. Brown ribs in batches, turning occasionally. Once all ribs have been browned, return all ribs into IP. Pour the coffee and pureed chile mixture into the IP over the ribs. When the display reflects 15 (which is 15 minutes since the IP has beeped), turn the setting on top of your IP to VENTING. Doing so allows the IP to quickly release any remaining pressure (also known as QPR or QR). I use a wooden spoon to carefully turn the setting to avoid close contact with the potential steam. You may also want to turn your IP away from cabinets to allow the released steam to escape freely. The pin at the top of your IP will drop when all pressure has been released and it's safe to open. 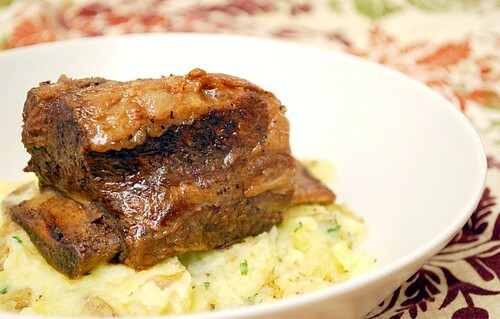 Transfer ribs to serving dish and serve with your favorite side dishes!